Children are receiving less than 8 percent of the federal budget—and this share fell 5.5 percent between 2014 and 2017, according to Children’s Budget 2017, our annual signature publication. Our latest review tracks 172 mandatory and discretionary programs whose funding is either entirely of partially dedicated to children’s health, early and K-12 education, nutrition, income security, housing, safety, training, and welfare. 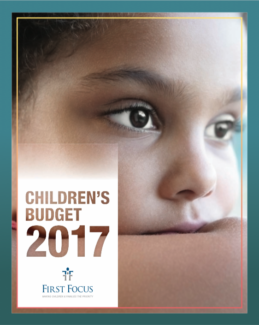 Children’s Budget 2017 offers a detailed guide to federal spending on children and an invaluable resource for those seeking to improve the lives of America’s youth. Also, be sure to check out our social media toolkit to share the report.